President Donald Trump’s new chief of staff, John Kelly, brings an uncommon resume to the job. 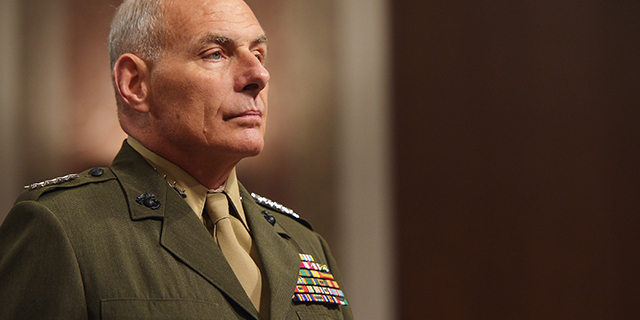 A retired Marine general, Kelly is the first chief of staff in more than four decades to come from the upper ranks of the military, and unlike most of his predecessors he has no prior work experience in the White House or campaign politics. 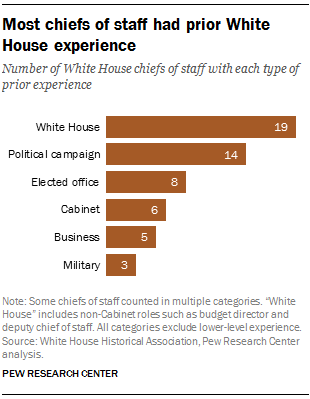 Another common steppingstone for the White House chief of staff job is campaign work, with 14 chiefs having previously worked in electoral politics. This group includes Reince Priebus, Trump’s first chief, who had earlier served as chairman of the Republican National Committee and the Wisconsin Republican Party. It also includes James Baker, who famously became Ronald Reagan’s first chief of staff despite having earlier run two political campaigns against Reagan. John Steelman is credited as being the first person to hold the position, starting in 1946 under Harry S. Truman. But while Steelman referred to his job as being “the president’s chief chore boy,” his successor, Sherman Adams, took on a role that might more closely resemble today’s powerful chiefs of staff when he began working for Dwight D. Eisenhower in 1953. “What if Adams should die and Eisenhower becomes president of the United States?” was a common joke at the time. In the modern era, the position has evolved into what one academic study deemed “administrator, advisor and guardian,” sometimes with a substantial foreign policy role. “You can very well make the argument that the White House chief of staff is the second-most powerful job in government,” James Baker recently told a biographer. Baker has a unique perspective: He is the only person ever to have come back for a second tour as chief of staff, joining George H.W. Bush’s team following his four-year tenure under Reagan. What kinds of backgrounds do U.S. attorneys general have?